• There are 21 rooms and 25 suites. • Restaurant where cooks the famous Chef Attilio di Fabrizio. • Business center, a jogging path, some meetings & events rooms, a school of cookery and fitness center. 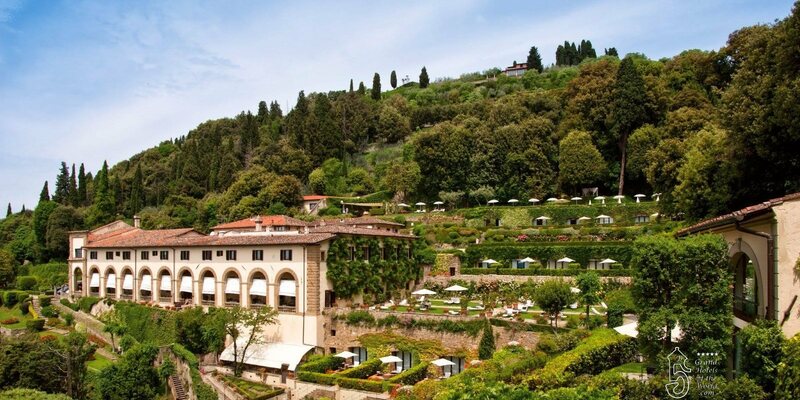 • Villa San Michele was an old monastery between the trees and the terrace with a panoramic view of Florence city. • 1500 around: Construction of the present building, the façade is attributed to Michelangelo. The monastery is run bu the Franciscans. • 1600: Building is enlared and renovated by Giovanni di Bartolommeo Davanzati. • 1808: Monastic orders all over Italy, including Villa San Michele were dissolved by the French Emperor Napoleon. • 1817: Vila San Michele becomes a Monastery again, but most of its treasures have been dispersed. • 1900: Acquisition of the Villa by Henry White Cannon from New York. The Villa and the gardens are restored in a Victorian styla. Glasshouses arre added to the gardens. • 1950: Acquisition by Monsieur Lucien Tessier as a private residence. • 1952 around: Due to the high cost to upkeep the property, Lucien Tessier opens the Villa opens as an Hotel. • 1982: Acquisition of the Villa by Orient Express Hotels.